The head of Chinese insurance and financial giant Anbang is reported to have been detained by the authorities. 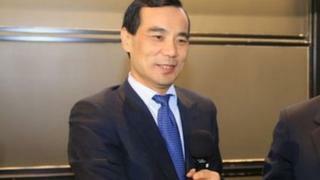 The company, one of the country's richest and most powerful, said Wu Xiaohui was stepping aside as chairman. It gave few details but said he was no longer able to fulfil his duties for "personal reasons". Chinese business magazine Caijing had reported that Mr Wu was detained by authorities last week, but later deleted its article. An official source told the BBC that Mr Wu had been taken away from the Anbang Office Building on 8 June by police who arrived in two cars. It is not clear where Mr Wu is now. If Mr Wu's detention is confirmed by the authorities, he would be the highest-profile target of the government's attempt to re-establish state control of the financial industry, and target corruption. Anbang is known for a number of high profile international acquisitions, like the purchase of New York's Waldorf Astoria hotel in 2015. The company, which manages some 1.65tn yuan (£190bn; $242bn) worth of assets, said in a statement that the chairman's duties would be managed by other senior executives. Anbang did not comment on the report by Caijing that he had been detained. In the past few years, high-level officials have often been detained for corruption in China. Found guilty of taking bribes, they're handed lengthy prison sentences and ushered out of public view. The Wu Xiaohui case is very different. Mr Wu masterminded the explosive rise of his company in just over a decade by selling relatively risky investment products - not traditional insurance policies. Still smarting about the collapse of Shanghai's stock market in 2012, Chinese regulators had warned about Anbang's "wealth management products". Another respected magazine, Caixin, published unusually frank exposes on Anbang in April. Like the New York Times before it, Caixin probed Anbang's murky ownership structure and whether it had enough money in the bank to carry out large overseas acquisitions. The articles addressed some of the greatest mysteries swirling around China: who really owns Anbang and who made way for its almost impossible rise from a tiny car insurance company to a global behemoth? If Wu Xiaohui and Anbang aren't what they seem, the entire Chinese economy, including many ordinary people with Anbang products, could be in for a fall. Anbang had recently been in talks with a real estate company part-owned by Donald Trump's son-in-law and senior White House adviser, Jared Kushner. The two sides were reportedly negotiating a deal to redevelop one of Kushner Companies' Manhattan buildings. The possible deal had raised media speculation over a potential conflict of interest and was called off by "mutual agreement" without any reasons given. Wu Xiaohui had long been considered one of the most politically connected men in China, having married the granddaughter of former leader Deng Xiaoping. His company has in recent years been among the biggest players of Chinese firms pursuing high-profile overseas acquisitions and investments. That purchase added 16 luxury properties across the US to Anbang's holdings, including the Ritz-Carlton Half Moon Bay, and the Four Seasons hotels in Silicon Valley and Washington. What do Kushner talks with China's Anbang mean for Trump? Anbang wants to buy Starwood, but who is behind the company?